ID:2338 May 13, 2017 Countries:Global Pages:275 Ameri Research Inc. The global cell isolation market was valued at $3.4 billion in 2016 and is anticipated to reach over $11.5 billion by 2024. 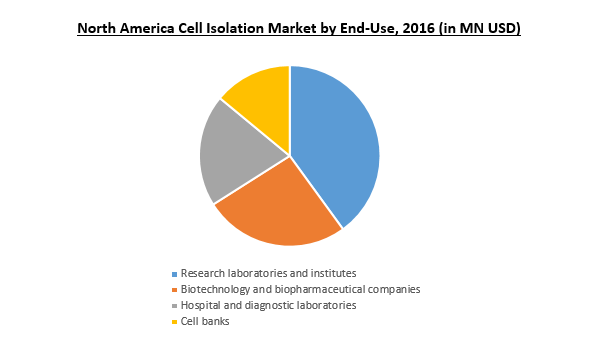 The cell isolation market is anticipated to witness robust growth owing to key factors such as rising investment in stem cell and cancer research, booming biopharma sector, growing demand for personalized medicine, and continuous innovation in product development and cell isolation techniques. Cell isolation is a process where a specialized cell within the heterogeneous mixture is extracted and processed to identify its properties and replicate it to develop new therapies. To determine the appropriate separation technique, a thorough analysis of cell size, cell behavior, density, antigen status and hydrophobic surface properties are performed. Moreover, the general considerations before the initiation of a cell separation process include toxicity analysis, physiological/immunological properties of cells, contamination, separation techniques and instrumentation required. The growing thrust for personalized medicine is a key factor boosting the demand for cell separation market. In the recent past, the U.S. FDA has approved few targeted therapies for cancer using molecular and genomic studies. For instance, Kalydeco, a drug for cystic fibrosis was approved in 2012 for patients with a specific genetic mutation (G551D) in a gene which is important in regulating the transport of salt and water. Furthermore, the U.S., Precision Medicine Initiative was launched with USD 215 million investment in the President’s 2016 budget to empower a new patient-centric healthcare model. The price for the cell isolation/extraction varies based on the process, technology, reagents, and other factors. Some of the key products available in the market include RoboSep, StemSep, SepMate, MojoSort, and RosetteSep. The cell isolation market by product includes instruments and consumables. The instruments are further segmented into centrifuges, flow cytometers, filtration systems, and magnetic-activated cell separator systems. The consumables segment includes consumables, reagents, kits, beads, and disposables. In 2016, the consumables segment accounted for the majority revenue share, owing to the high volume of products used routinely to perform cell separation or extraction. The use of consumables is relatively low in research labs, compared to the usage in the biopharmaceutical industry. However, the instruments category is also anticipated to witness rapid growth due to innovation and technological advancements. The booming research sector and biopharma industry are expected to reinforce the market growth over the forecast period positively. Based on cell type, the market is segmented as, human cell and animal cell. The human cell segment dominated the market in 2016 with a share of over 50% and is predicted to retain its share through the forecast period. The growing emphasis on animal cell study to find solutions for complex problems, and to replicate some of the unique features for human use is amongst the key drivers for market expansion. Based on Technique, the market is categorized as centrifugation, surface marker, and filtration. The centrifugation process is based on density and size of the sample. In 2016, centrifugation technique accounted for the maximum share owing to its wide usage in research labs, biopharma industries, academic centers, and cell banks. The density gradient centrifugation is of two types, Rate Zonal Centrifugation and Isopycnic Centrifugation. In rate zonal centrifugation, the sample is placed in a location on top of the centrifuge tube. The centrifugal force leads to the sedimentation of particles through density gradient in separate zones. The market by application includes, biomolecule isolation, cancer research, stem cell research, tissue regeneration, In Vitro Diagnostics, and Therapeutics. Biomolecule isolation was the largest application segment in 2016, due to the growing manufacturing of monoclonal antibodies, recombinant proteins, biosimilars. However, cancer and stem cell research are anticipated to register a higher growth rate over the forecast period. Increasing prevalence of cancer is a key factor leading to high investment in this sector. The various end-use categories include research laboratories and institutes, biotechnology and biopharmaceutical companies, hospitals and diagnostic laboratories, and cell banks. The research laboratories and institutes accounted for the majority revenue share in 2016, and this segment is anticipated to extend its dominance over the forecast period. North America accounted for the maximum revenue share of over 40% in 2016. The high share is attributed due to the presence of a large number of biopharmaceutical and biotechnology companies, research centers, strong government support for personalized medicine and genomic studies. Moreover, the high focus on cancer and stem cell research is also a key factor contributing to the region’s dominance. Asia Pacific is anticipated to grow at a higher CAGR over the forecast period owing to the rising expenditure toward genomic research, development of innovative biosimilars, to tackle the high disease burden in the region. The countries such as India, China, Vietnam, Philippines are investing heavily to improve the healthcare and biopharmaceutical sector. Which is anticipated to boost the biosimilars, stem cell therapies over the forecast period. Few manufacturers in India such as Dr.Reddy’s Laboratories and Biocon, are leading the biosimilars manufacturing to compete with the global players. The global cell isolation market was valued at $3.4bn in 2016 and is anticipated to reach over $11.5 bn by 2024. The growing thrust for personalized medicine is a key factor boosting the demand for cell separation market. The price for the cell isolation/extraction varies based on the process, technology, reagents, and other factors. North America accounted for the maximum revenue share of over 40% in 2016. The high share is attributed due to the presence of a large number of biopharmaceutical and biotechnology companies, research centers, strong government support for personalized medicine and genomic studies. The key market participants include Bio-Rad Laboratories, Inc., Merck KGaA; Beckman Coulter, Inc.; STEMCELL Technologies Inc.; BD Biosciences; Terumo BCT; GE Healthcare; and Thermo Fisher Scientific, Inc.